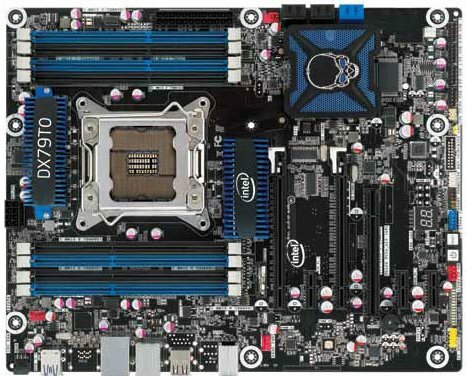 Intel's DX79TO motherboard has hit the market for $230, but as VR Zone points out it seems like a poor offering, the mainboard is quite expensive yet lacks a lot of features. We don't quite know what to say, but Intel's Extreme motherboards are getting less and less extreme by every iteration and after a slight delay Intel's more affordable X79 motherboard, the DX79TO has arrived, but it fits more into Intel's lower-end motherboard ranges than in the extreme category in our opinion. In fact, the DX79TO is a feature stripped DX79SI, something we didn't quite expect, especially as the DX79SI wasn't exactly breaking new territory so to say. So what are we looking at here? Well, for starters Intel has gotten rid of the x8 PCI Express slot and in lieu of that you get a x1 slot. Gone is also the front USB 3.0 ports, the secondary Gigabit Ethernet port, two audio jacks and the optical S/PDIF out. The two lower heatinks appear to no longer be connected via a heatpipe, instead a piece of metal connects them and it's possible that Intel has removed the top PWM heatsink as it's missing in the manual, but still present in the product brief. Also missing is the bundled Wi-Fi/Bluetooth ad adapter that comes with the DX79SI.